USDA Choice is the grade that is found at most markets and butcher shops, but if you really want to splurge, go for Prime grade. Unfortunately it will be twice the price and have more fat, your cost will be much higher, so is the price worth it? Well it depends on how much you can afford and your taste! USDA Choice is an excellent grade of beef with slightly less marbling than Prime and this is what most restaurants use today except for high-end steak houses and some hotels. The key to a good roast is to be sure you're getting a Choice USDA graded roast, and then look for meats that might be noted as Certified Angus or Sterling Silver. Always buy it from a good source such as a butcher shop or a specialty food market, as they have access to the best Choice grade meats sold on the wholesale market. Most supermarkets get what's left after these purveyors take the best for themselves. So now you know where you will buy it. When there, ask the butcher trim the cap and some of the excess fat, but leave a layer of fat to protect and baste your roast as it cooks. A 1/4 to 1/2 inch layer is a good amount; ask the butcher to tie the roast as well. The true prime rib is known to restaurants as the "#109"; this specification is a roast-ready piece of meat that contains seven ribs, 6th to the 12th. In slicing the cooked rib a restaurant would normally give 14 slices or portions: 7 with the bone and 7 without. Cost per slice is a determining factor and a skilled chef can even get 16 to 20 slices per roast---but the customer gets less of a value for the price charged. When choosing a prime rib roast for home, select at least a three rib bone portion. Anything smaller is hard to cook properly. 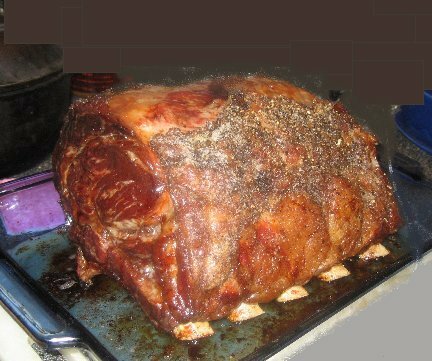 A three-rib roast will weigh in at about seven to eight and a half pounds and feed about six people. Count on feeding two people per rib, the on the bone and off the bone cut described above. 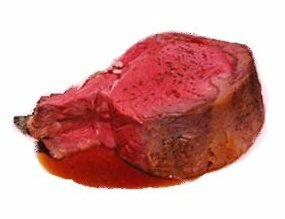 Beware---in cooking a prime rib and other roasts, there is always a 20% shrinkage in weight after cooking. For example, for a restaurant roasting a 20 pound rib, after 3 1/2 hours of cooking, it will weigh in at 16 pounds! A good digital instant-read meat thermometer is essential to cooking to an exact doneness. It's the only sure way to tell when your roast has achieved a desirable temperature. Allow the roast to sit out for up to one hour right before roasting to take the chill out of it. It will need seasoning and some preparation to get it into the pan; you can count this in the hour's time. First preheat your oven to 450 degrees and get your roasting pan and other ingredients ready. Rub, season, with ground black pepper, coarse salt and some canola oil all over the roast, covering all exposed meat and fat. Place the roast in a sturdy roasting pan, bone-side down. No matter what size roast you have, you will first start it in a pre-heated 450 degree oven for 15 minutes, then reduce the temperature to 350 degrees for the balance of cooking time. Cooking times will vary depending on size of the roast and desired level of doneness. The following chart gives approximate times to reach "rare" at various sizes. Turn the roast over after 1 hour and 15 minutes and and then back to the bones on the bottom after 2 1/2 hours. Be careful as fat will be in the bottom of the pan, it will be hot, and you don't want to spill or splash any on you or the oven. Use a sturdy kitchen fork and ask someone one to assist you in this process---especially if you are roasting a full 22 pound size rib! Using your meat thermometer, about a half hour before the expected end of the roasting time, insert it in the thickest and central part of the meat, not touching the fat or bone. When the internal temperature reaches 120-122°, pull it out of the oven---if you want it rare. Let the roast sit for twenty to thirty minutes. It will continue to cook during this time, reaching a temperature of about 125°. While the roast is resting, add 1 quart or more mirepoix to the pan and fry/caramelize on medium-low heat. Drain the fat, saving some for the popovers, and deglaze the mirepoix and pan with beef broth or stock to make the au jus. Strain the juices and remove any fat and then keep the au jus warm. About ¼ to ½ cup of prepared horseradish, drained of the vinegar juices and rinsed under cold water, mixed with two cups of béchamel sauce thinned with heavy cream and seasoned with salt, ground white pepper and a few grinds of fresh nutmeg. A traditional English side dish to Prime Rib is Yorkshire Pudding, an egg and flour batter poured into the roasting pan with the fat and then baked in the oven. It comes out like a custardy, biscuity soufflé pancake. The American version of this is individual Popovers, the same recipe but they are crisper and almost soufflé looking and shaped like a muffin. Carving: see any number of videos on the Internet. Then use a long, very sharp knife to carve your roast! Serve with popovers, au jus and Raifort sauce.